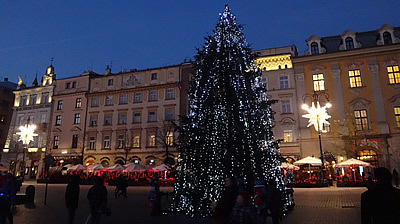 Krakow has a lot to see apart from the beautiful Christmas Market and we made good use of the short time we had here criss-crossing the city. 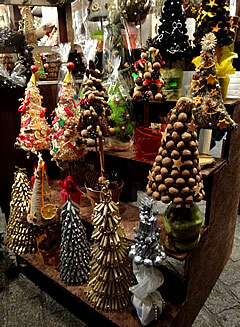 We arrived quite early in the morning, flying in from Basel, and had planned to take a train into the city. Unfortunately, what we thought was a train station turned out to be a deserted platform with only a shelter and no information. 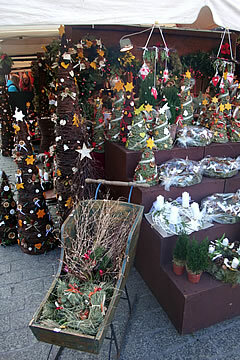 So we took a cab instead, straight to the Hotel Wentzl on Rynek Glowny - the Main Market Square. 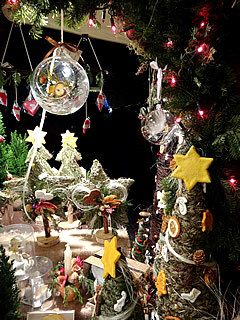 ... even more magical at night. 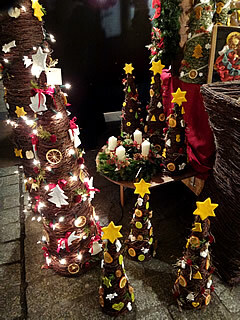 Apart from its excellent location the hotel itself is lovely, with only eighteen rooms, and we had one looking out over the square and its Christmas Market - an excellent start! Gothic embellishments to a 13th century base. 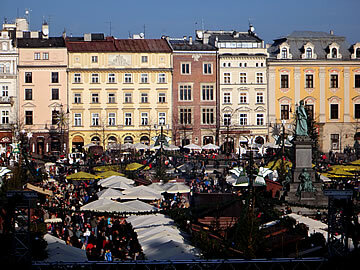 The square was built after Mongol invaders ransacked Krakow in 1241, leaving it in ruins. 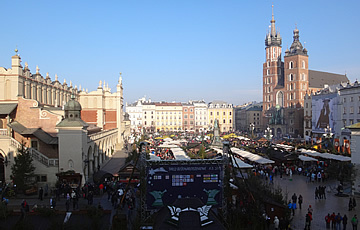 Rather than clear and rebuild on the same site, the decision was made to move the city north and the large market square - 200m by 200m was created. One of the few major constructions to survive from this time is the Town Hall tower, all that remains of the thirteenth century Town Hall which was demolished in the nineteenth century. 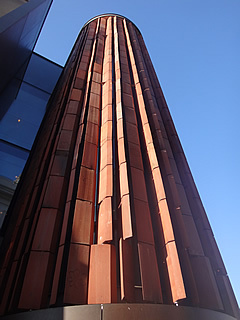 The tower itself has undergone a number of expansions and improvements, dictated by circumstance (fire for instance!) 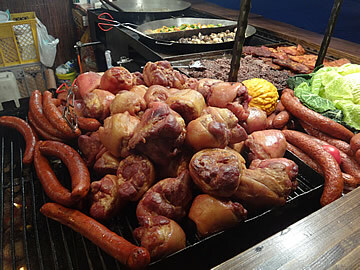 or taste. 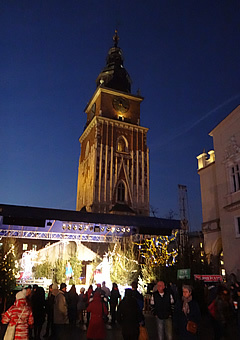 The church with the mismatched twin towers on the square is the 15th century Mariacka - or St Mary's - Basilica. A bloody legend has the mismatched towers as being the result of a feud between two warring architect brothers which ended in one killing the other and then committing suicide. 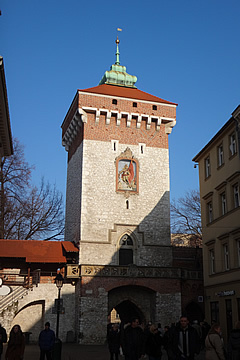 The truth is somewhat more prosaic: the 69m tower was built to house the bells, the 81m tower was a watchtower. 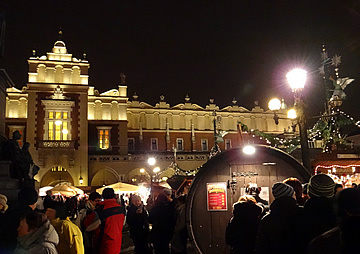 The beautiful medieval Cloth Hall - the Sukiennice - stands in the centre of Rynek Glowny. 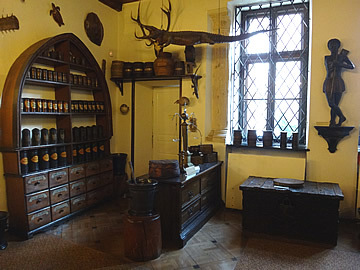 A fire devastated the original hall in 1555 resulting in the creation of the current Renaissance building, though the arcades are a nineteenth century addition. 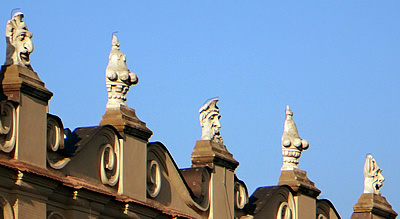 Grotesques on the roof line of the Cloth Hall. 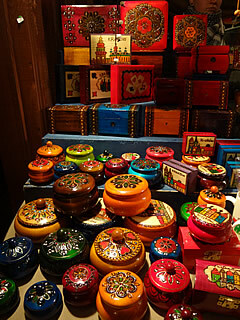 It has souvenir stalls on the ground floor, and a gallery on the first floor, but it is the exterior which impresses most. 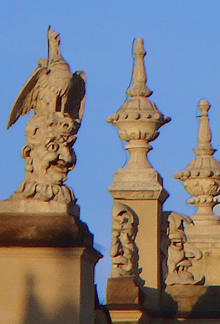 I particularly like the grotesques on the roof line! 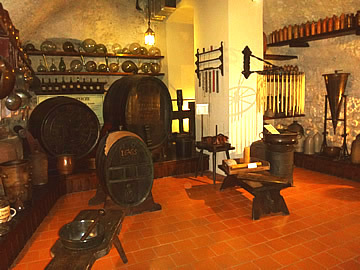 The oldest written record of Krakow is in the accounts of a Sephardic Jewish merchant, Abraham ben Jacob, from Cordova in faraway Spain. 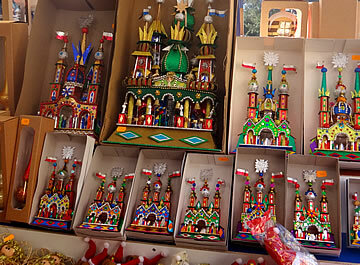 He mentions visiting the trading centre of Krakwa. Jews only came to settle in Poland after 1264 when King Boleslaus sent out an invitation to them to settle in his country. 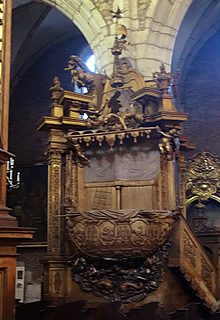 The boat-shaped pulpit in Corpus Christi. 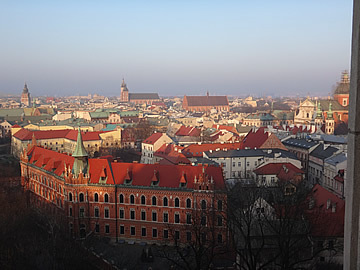 As is common throughout Jewish history, after a time of persecution, Jews were expelled from Krakow in 1494. 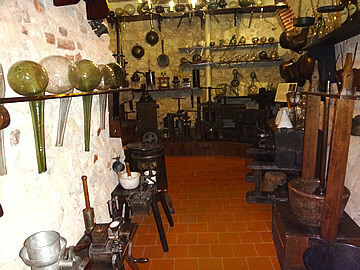 Many moved only outside the city walls to settle in Kazimierz which became very prosperous in later years. 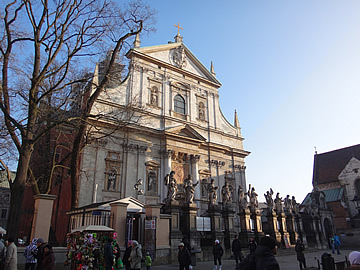 The area was Christian too, of course; founded in 1340 Corpus Christi Basilica stands on the western edge of Kazimierz. and was the first church in the district. With the advent of the Second World War, Jews were again severely persecuted and Jewish culture almost completely obliterated. Jews were first herded into ghettos, then deported to concentration camps where millions were killed. 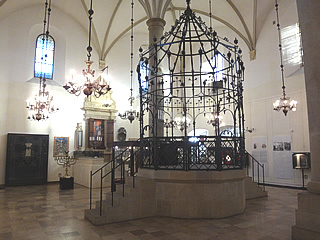 Interior of the Stara Synagogue. 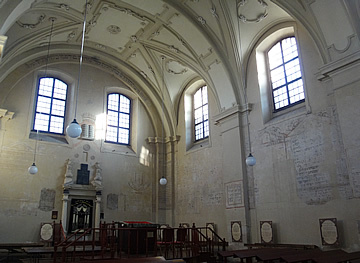 Now a very small population of Jews still inhabits Kazimierz and only one active synagogue remains. We wandered around the area looking into the synagogues. The oldest is Stara Synagoga - also known as the "Old Synagogue" for obvious reasons. It was built in the fifteenth century, but sources differ as to whether this was at the beginning or the end of the century. 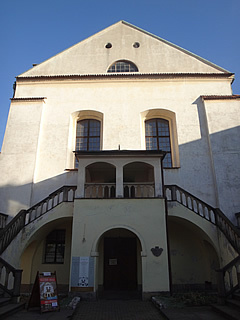 Whichever it is, it is the oldest synagogue in Poland, now hosting historical exhibits connected with Jewish history. 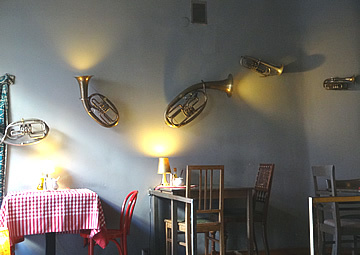 We had a very good lunch at Warsztat - a music-themed cafe that served excellent chili con carne pancakes! 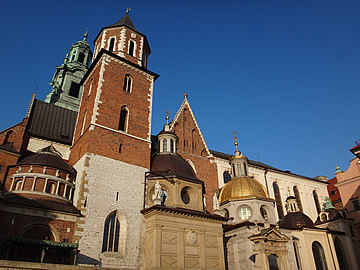 The Synagoga Wysoka dates from the latter half of the sixteenth century and was the third to be built in the city. 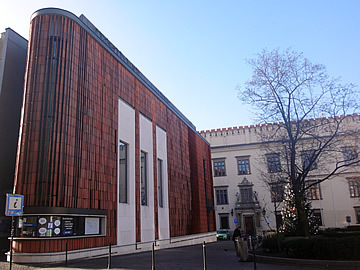 It is also called the High Synagogue because the prayer hall was on the first floor, the ground floor being occupied by shops. 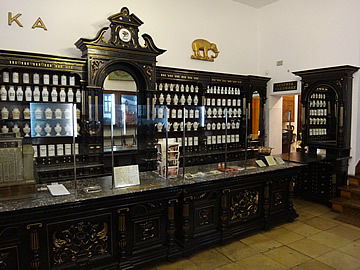 Today it is little different, though the prayer hall is no longer used for its intended purpose and has exhibitions instead, the lower floor is a Jewish bookshop. 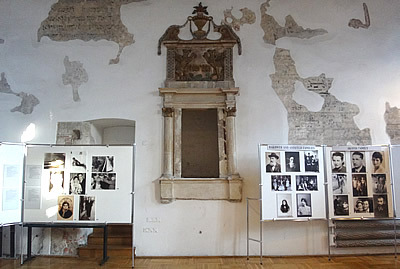 An exhibition on the first floor of the Synagogue Wysoka tells the stories of local families through the period of the Second World War. 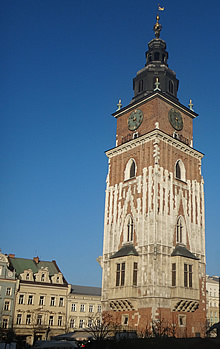 Completed in 1644 this is the largest synagogue in Krakow. 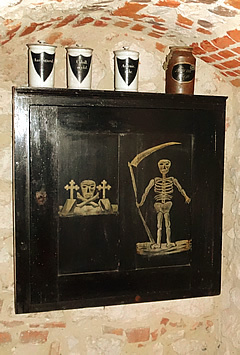 These are the original 17th century wall paintings. 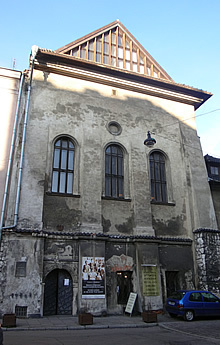 17th century Isaac Synagogue is the largest in Kazimierz, but it is another that is no longer in use. 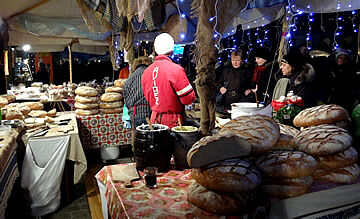 That evening we returned to Kazimierz for an excellent dinner at Starka Restaurant and Vodkas. 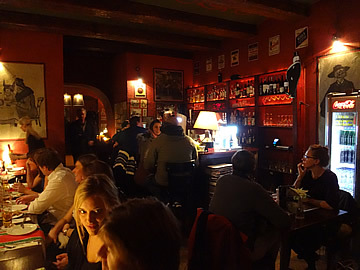 A lovely intimate place, cosy with its deep red walls and strategic lighting; a great atmosphere - and lots of vodkas on offer! 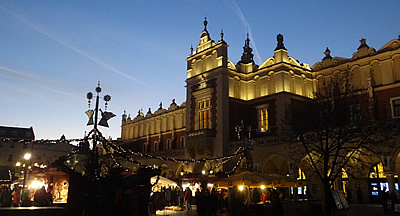 The massive market square, Rynek Glowny, divided by the beautiful medieval Cloth Hall, is perfect to host a Christmas Market. 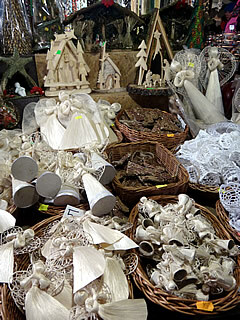 A vast number of stalls sell Christmas decorations, toys and many kinds of handicrafts including carved wooden items, embroidery and local pottery. 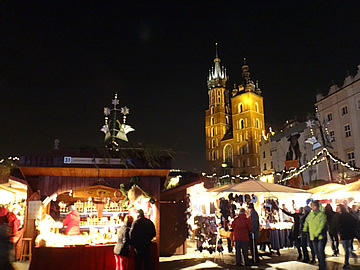 In addition there are lots of stalls selling food and drink - one of the best parts of Christmas Markets is being able to taste local foods and there's nothing better than hot grzane wino/glüg/glühwein/vin chaud/mulled wine on a crisp, cold winter's day. 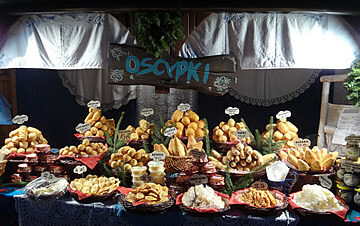 Toasted oscypki - even better! 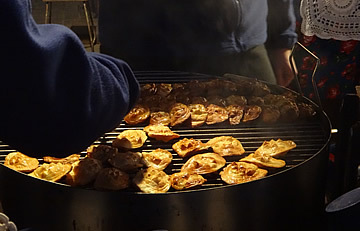 Smoked cheese made from salted sheep's milk - very good! 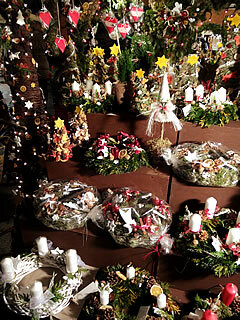 Outdoor stage with lots of different musical performances - singers, musicians, choirs. 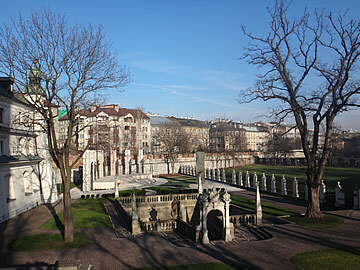 Standing on the steps of the Pauline Church of SS Michael and Stanislaus looking across the Stanislaus Fountain to the long sweep of buildings on Paulinska. 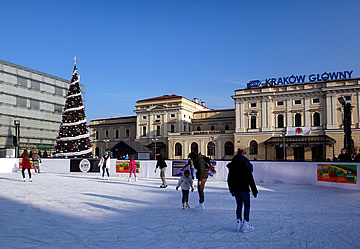 The ice skating rink in front of Krakow Glowny railway station. 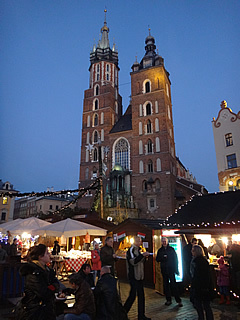 Krakow became a bishopric in 1000, reflecting its continued growth and importance. 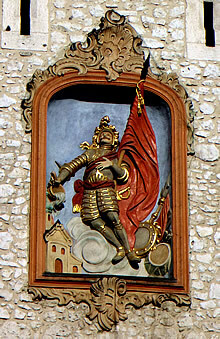 In 1079 one of the first bishops, Stanislaus, was beheaded by King Boleslaus the Bold. 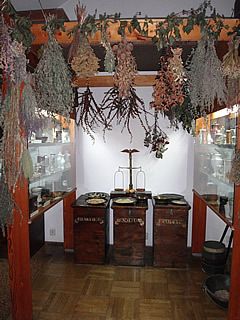 Legend has it that the various parts of the body were dumped in a pond but the body miraculously reformed, generating stories of great healing powers for the waters. 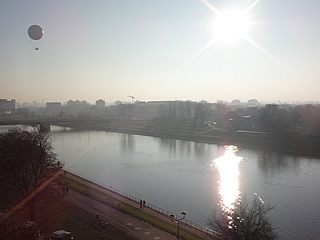 The Pauline Church of SS Michael and Stanislaus now stands where the dastardly deed was done, on what used to be a rocky promontory above the Vistula. 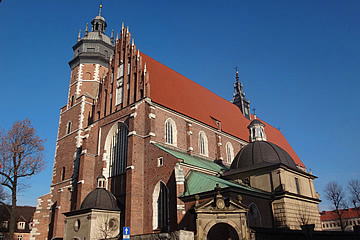 The church is thus commonly known as "Skalka" or "Rock" and within its grounds is the Stanislaus Fountain. 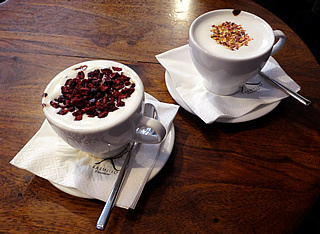 More than once we had hot chocolate drinks at Karmello on Plac Wszystkich Swietych flavoured with chili or cherry or just plain - really excellent! 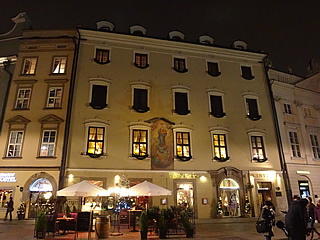 A very interesting looking building spotted as we walked south down Grodska Street from Rynek Glowny. 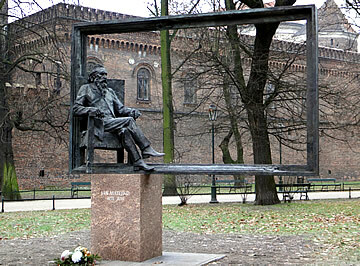 A rather good monument to Jan Matejko, a nineteenth century Polish artist. 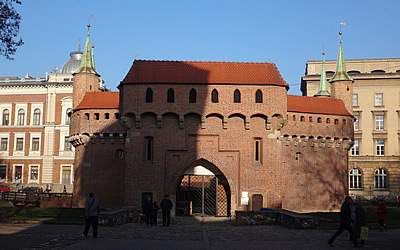 It stands in the green park around the Barbakan Krakowski on the north city walls. 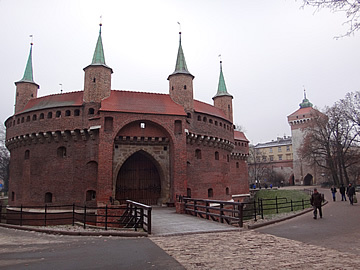 North is the Barbakan Krakowski - a massive circular brick structure built around 1498 as extra defence and once connected to the gate by an underground passage beneath the moat. 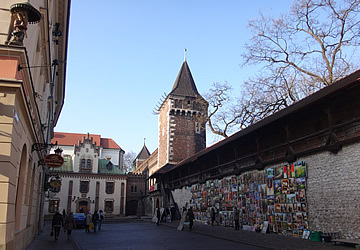 Remnant of the medieval city walls. 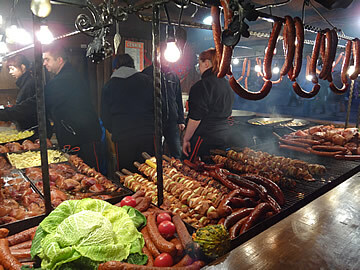 Barbakan Krakowski with the Florian Gate behind. 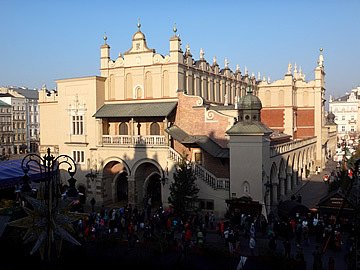 The first Baroque building in Krakow. 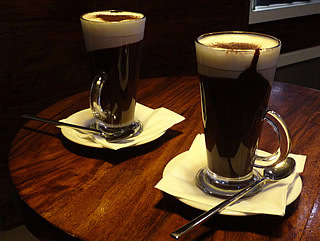 And more hot chocolate at Karmello! 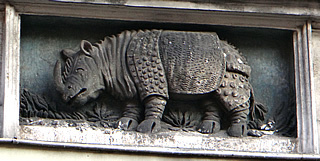 On a building at 38 Grodzka. 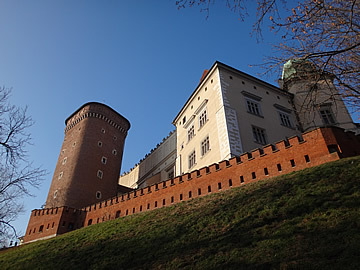 Surrounded by a wall, castle and cathedral stand on top of Wawel Hill high above the Vistula. 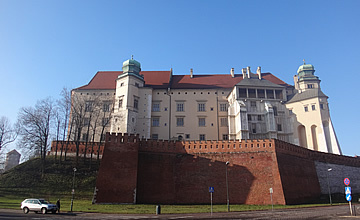 Though a fortress has stood on this site since the eleventh century, the current castle dates mostly from the sixteenth century. In fact fortifications have existed here since the ninth century when the Vislane tribe were taking advantage of its defensive position.2 The hill became a centre of Christianity for the country, a cathedral being first built here in 1000. Ladislas the Short began the third cathedral in the fourteenth century. In a Gothic style it superseded the two previous Romanesque cathedrals. 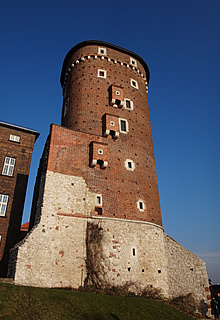 In the late fifteenth century three tall brick towers were added to the castle: Thieves, Sandomierz and Senatorial towers, and in the early sixteenth century the Gothic residence was replaced with a splendid Renaissance palace. 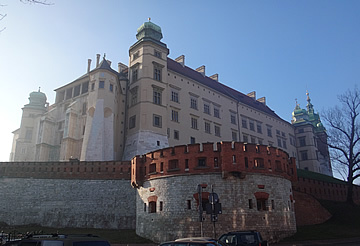 For the whole of the nineteenth century Poland had lost its independence, and Castle Hill was occupied by Russians, Prussians and finally Austrians. 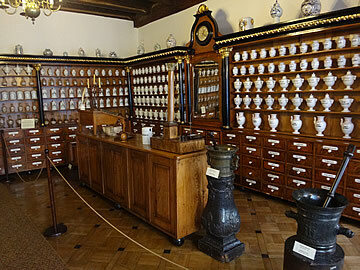 Today the castle State Rooms and apartments have been restored and there are a number of museums to visit. 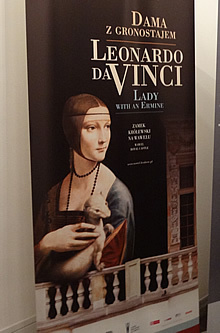 We restricted ourselves to visiting the cathedral and the castle State Rooms, and a special exhibition of Leonardo da Vinci's Lady with an Ermine. An absolutely stunning painting, and the most important in Polish collections. Cathedral on the left, castle on the right. 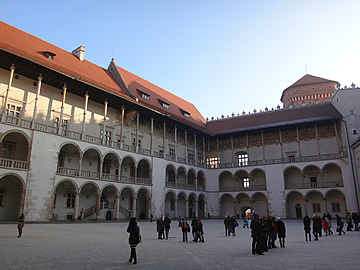 The beautiful Renaissance courtyard in the castle. The ceiling in the Hall of Deputies of the State Rooms must have looked amazing when it was complete. 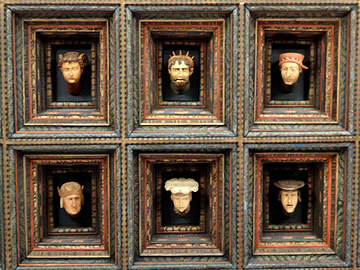 As it is, only 30 of the original heads gaze down from the coffered ceiling. It would be nice to know who they are but practically all that can be said is that they look as if they are modelled on real people and seem to come from all walks of life. 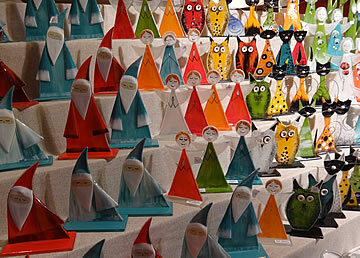 Perhaps symbolically keeping an eye on their representatives! 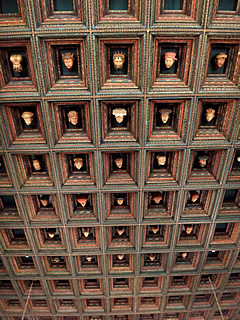 Ornate coffered ceiling studded with wooden heads in the Hall of Deputies. 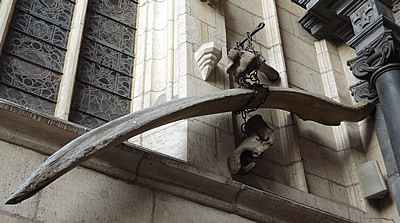 Prehistoric animal bones hanging on the cathedral. As would be expected from such an ancient site, legendary stories abound. 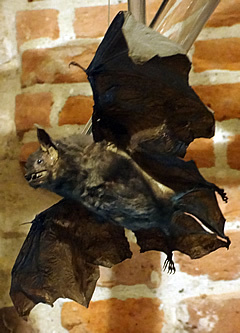 One tells of a dragon said to have inhabited a cave at the base of Wawel Hill. Various versions of the story have the dragon being slain by heroic knights or humble townsmen. 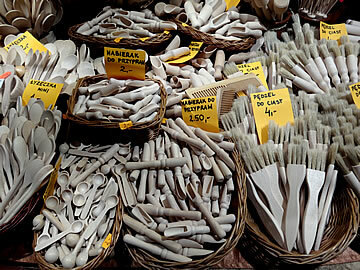 Outside the cathedral entrance hang a number of prehistoric animal bones excavated on the hill. Another legend says that as long as the bones remain suspended the cathedral will stand. 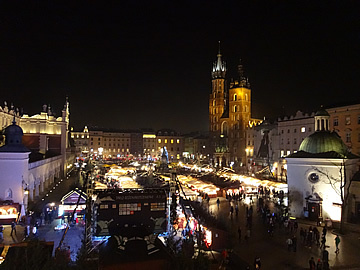 We climbed the Sigismund Tower of the cathedral for a beautiful view over the city. 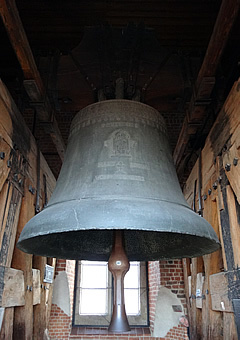 The Sigismund Bell hangs here, cast in 1520 and almost two and a half metres in diameter it weighs 9.65 kg and can be heard 30 km away. 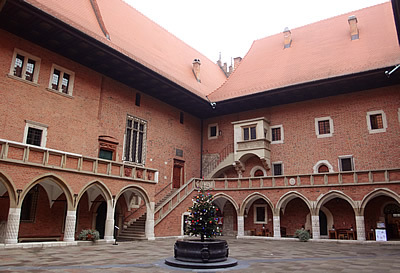 Fourteenth century Collegium Maius is the oldest building in the Jagellonian University - in fact the oldest university building in the country. 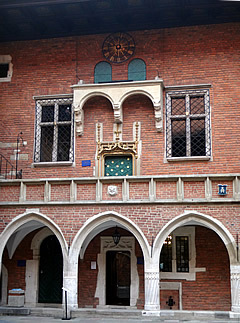 The original house was expanded to encompass adjoining houses in the fifteenth century and a central arcaded courtyard was created with a professors' staircase leading to the upper floor. 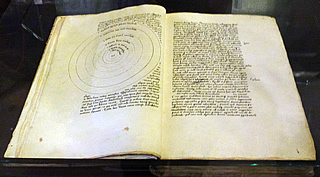 Facsimile of the Nicolaus Copernicus' manuscript. 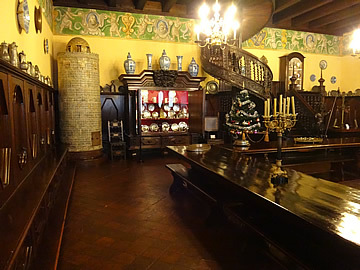 In medieval times, and recreated now, the dining room had three long tables set in an inverted U shape. It was the custom during meals for the youngest scholar to stand and read from the Bible or scholarly works. 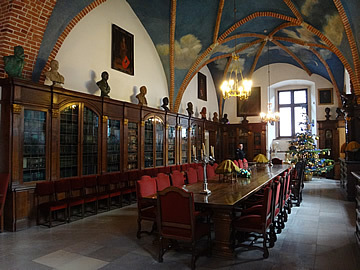 Our main interest in coming here was the connections with astronomy - Copernicus was a student here in the 1490s. He created a whole heap of trouble with his celestial model which set the sun - rather than the earth - at the centre. Naturally this did not please the Catholic church. 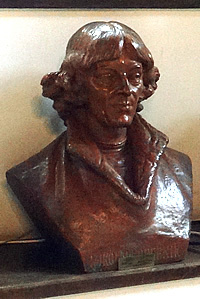 Nicolaus Copernicus (1473-1543) studied at Krakow Academy from 1491 to 1495. 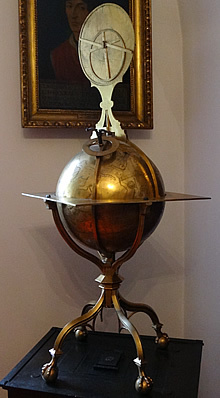 In the room called the Nicolaus Copernicus Treasury there are three astronomical instruments dating from that period, brought to Krakow in 1494 so Copernicus may well have used them. 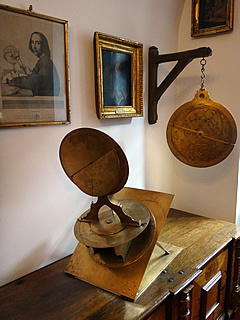 On the left is a Torquetum,1480, on the right an Astrolabe,1486. 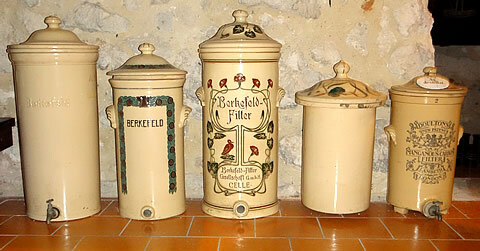 Both by Hans Dorn of Buda. 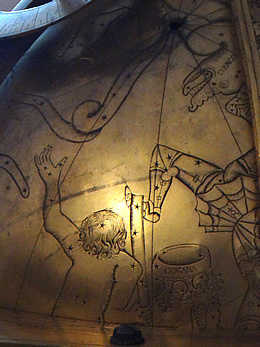 The coil and dragon head at the top is the constellation Draco, the man with raised arm is Bootes, the leg belongs to Hercules and between them is Corona, on the left the tail of the Great Bear. 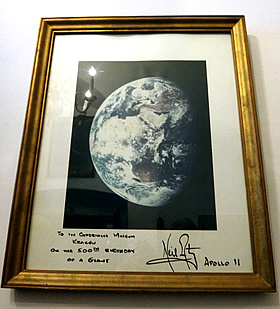 "To the Copernicus Museum Krakow on the 500th birthday of a giant"
Signed Neil Armstrong, Apollo 11. 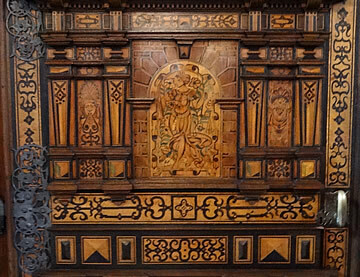 Detail from a beautiful door, over 500 years old. 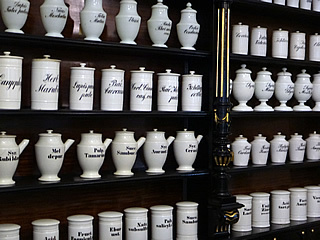 Located in a beautiful historic townhouse at 25 Florianska the museum is part of the Jagellonian University and is one of the largest and best in Europe. 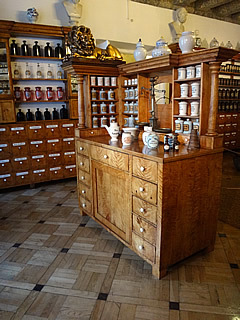 An impressive 22,000 exhibits range from ancient lab equipment, mountains of glassware beautiful jars,to medical books and documents, but I liked best the lovingly recreated pharmacies and rooms from past centuries. 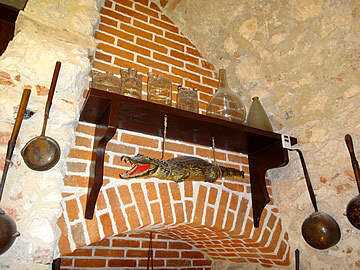 The 15th century house is itself interesting - especially down in the vaulted Gothic cellars. 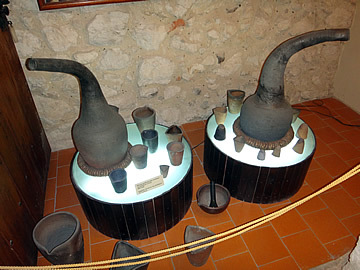 17th century graphite retorts for dry distillation. 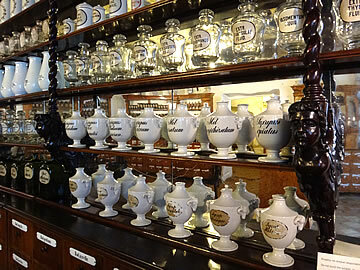 From the Golden Lion pharmacy. 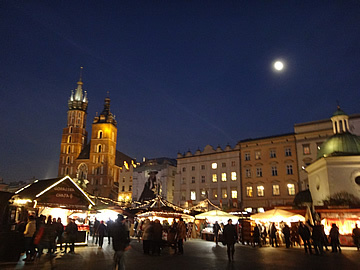 Of course we walked through Rynek Glowny many times during our exploration of the city but on our final night we spent part of the evening here trying different foods and buying Christmas gifts. 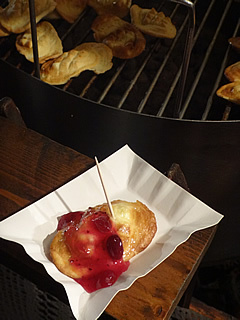 Oscypki with cranberry sauce - very tasty! Lonely Planet guide Krakow Encounter was used on this visit.